Take a tour of our photo gallery to see how Worldscreen can offer sunlight, glare and privacy solutions. For a restaurant affected by inclement weather in northwestern Florida, Worldscreen designed a patio enclosure to shield customers. The screen dramatically increased the amount of outdoor seating that the restaurant could offer, keeping cool air inside the patio during warm days and blocking gusts of wind on chilly days. Worldscreen found a fabric that matched the restaurant’s orange color scheme, which attracts attention from new clients. 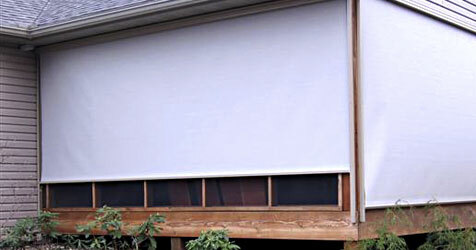 A homeowner in St. Louis, Mo., decided to surround her patio with a Worldscreen patio enclosure to ensure greater privacy from the main road that ran behind her property. The resulting patio enclosure not only added privacy; it also increased the aesthetics of her patio and offered more protection from the elements.